The RSGB contest provided an ideal opportunity to focus activity on the higher HF bands. Previous John M0UKD and I had built beams for 28 MHz 3e beam and 21 MHz 4e beam using the design on DK7ZB website. 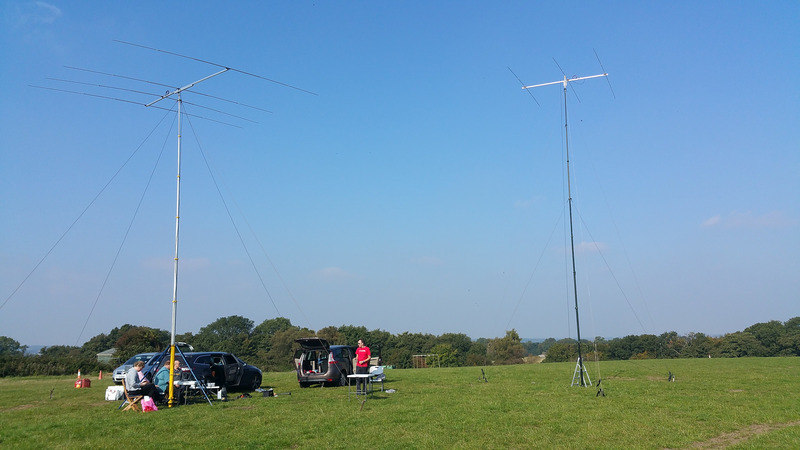 28 MHz is a compact design using a 3m boom, and 21 MHz is somewhat bigger at 5m boom. 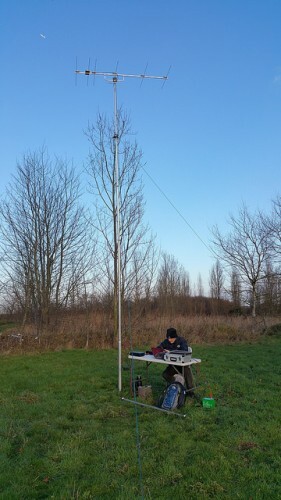 The Racal PU12 mast was used for the 28 MHz antenna and Clark 10 for the 21 MHz antenna. Power was provided by the Honda 2KW silent generator and the radio was provided by George M1GEO the Icom 7700 delivering 200w RF. John M0UKD helping to assemble to 21 MHz (Left) and 28 MHz beams. The operating was alfresco as the October weather was sunny and warm. The shack table was positioned close to the mast ready for armstrong rotation. 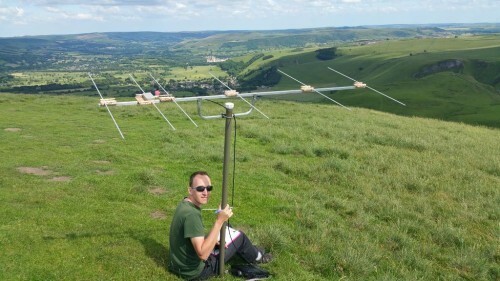 The Clark mast was modelling some new blue legs, recently fabricated by Brian 2E0FHU. They worked perfectly and once assembled they provided a sturdy base. 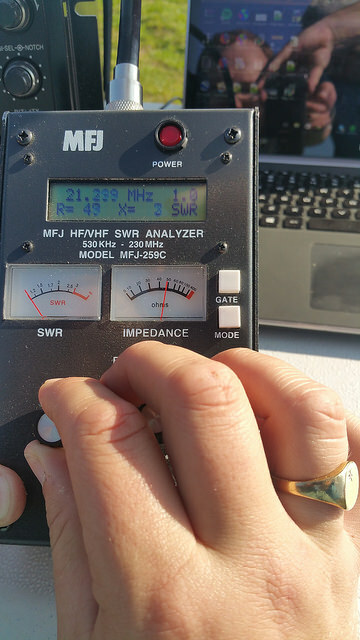 A quick check with the MFJ analyser confirmed the antenna was spot on resonance, and so the CQ calling could commence. Despite a valiant effort on both 21 and 28 MHz conditions did not support the number of QSO we had hopped, in fact you could say it was a challenge to work anyone at times. QSO could be hard to tease out, and we decided the best method was to work anyone we could hear. 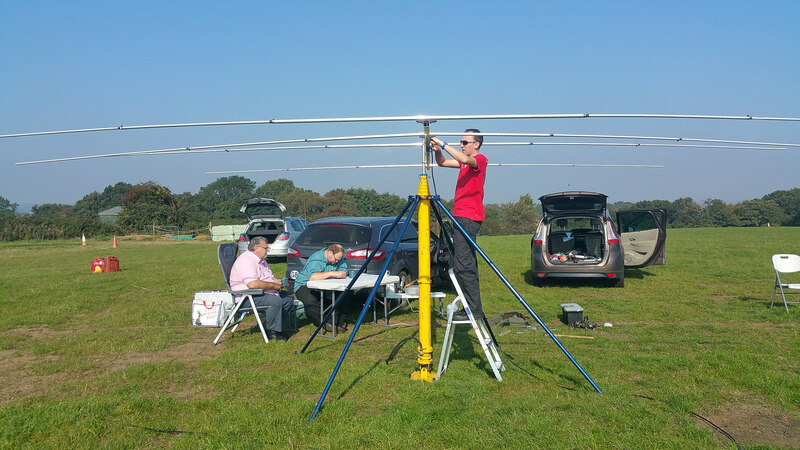 Some big DX did arrive, as we managed to work ZS6AI, ZS5DCF, CX8DS, VP8NO and PS8BR to name a few. The bands did seem to be open, at one stage we listened to a CW beacon in South America that was very loud (apparently 10w). 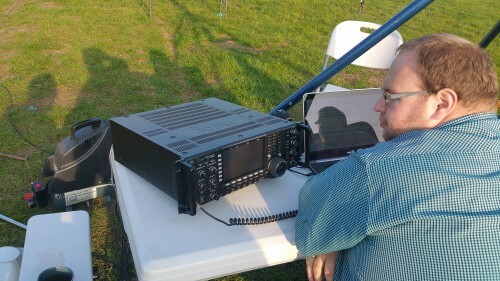 M1GEO George driving the Icom 7700. 21 MHz beam (Left) on Clark 10m mast — 28 MHz beam on Racal PU12 mast. Despite the lack of activity or poor band conditions we enjoyed our time operating outdoors in the sunshine. Both homebrew beams worked well, and this may well be the last time we operate outdoors in 2015. Further pictures from the day are available online. 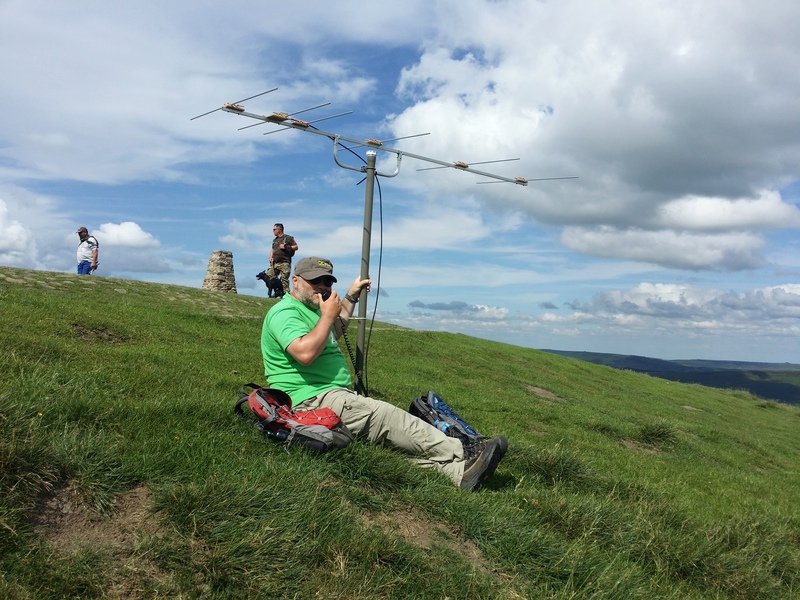 John M0UKD and myself decided it would be fun to work a few in the VHF NFD from Mam Tor at 517m ASL. 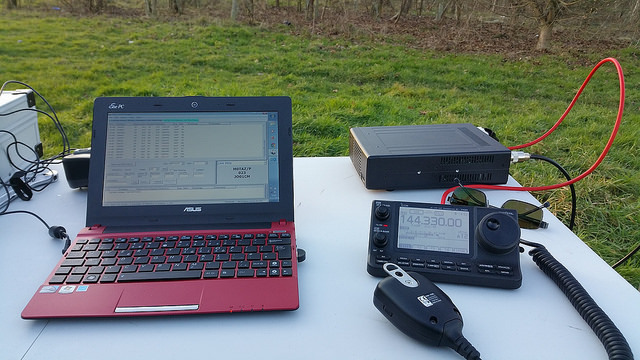 Using John’s FT 897d and 20w battery power and his 6e homebrew PEGTENNA. The walk is quite short and the “summit” is not a SOTA, its a simple walk up from the National Trust Car park. The walk is well defined up a stone path, most of the way is simply steps to the top of the hill. The views to the South are quite good, but the path is not so good to the North West, North or North east. We selected it as its a simple walk, and as we only intended to operate for 1 Hr, it would be nice to select a quick activation. Once on site, at the top of the hill we discovered two things, it was very popular with families, dogs and children and it was also very windy. The hill top was several degrees below that of the car park, and with the wind chill it felt distinctly chilly. 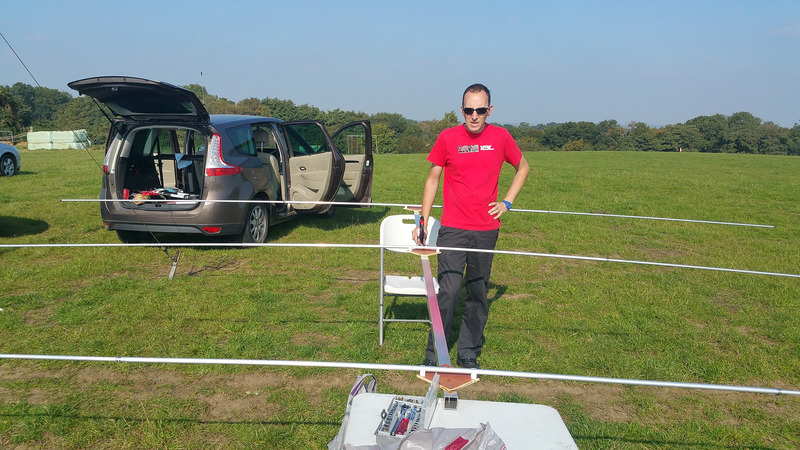 Here is Dave @M0TAZ supporting the antenna. Best DX for the day was F4HJC/P in JN19 at 579 KM. We worked a total of 24 stations is 60 minutes. A map of the QSO’s can be seen below. The RSGB run a number of top band contests through the year. The first is the February 1.8 MHz covering both SSB and CW. John M0UKD and myself have taken part in these for a few years now, most notably 3 years ago in 6″ of snow, and last year getting the car bogged in the mud. Thankfully this year was mild, and not so muddy. The contest runs from 9PM to 1AM, and using a top band dipole fed with 300 Ω feeder. 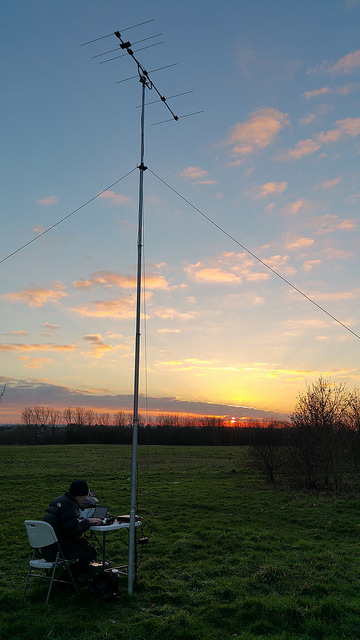 The centre of the dipole was at 60 ft (18m), and with a span of 260ft (80m) you need a large back garden (or access to a large field in the country). Using an Icom 7100 and 32w (the maximum for this part of the band) we managed to work 60 stations including England, Wales, Scotland, Ireland, France, Netherlands and Germany. 144 MHz Christmas Cumulative Contest. Operating alfresco in the UK Christmas Cumulative Contest with John M0UKD from Hornchurch country park. Located in JO01 at a height of just 20m ASL. Using a Icom 7100 battery powered, with a push up mast at 6m. 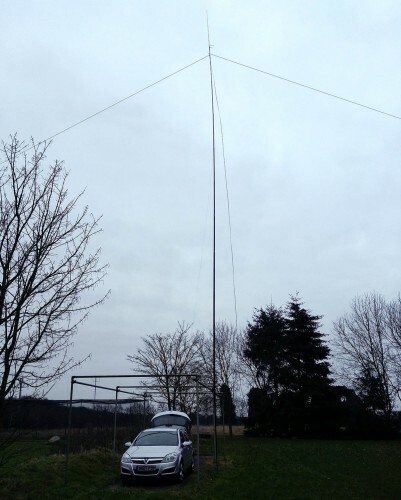 The antenna was a UKD designed 6E pegtenna, with a gain of 9.3 dBd. We worked 43 stations, with our best DX 280km into Wales GW8ASD. Other highlights included working into JO03 (quite rare) and ON5AEN (JO10) in Belgium. 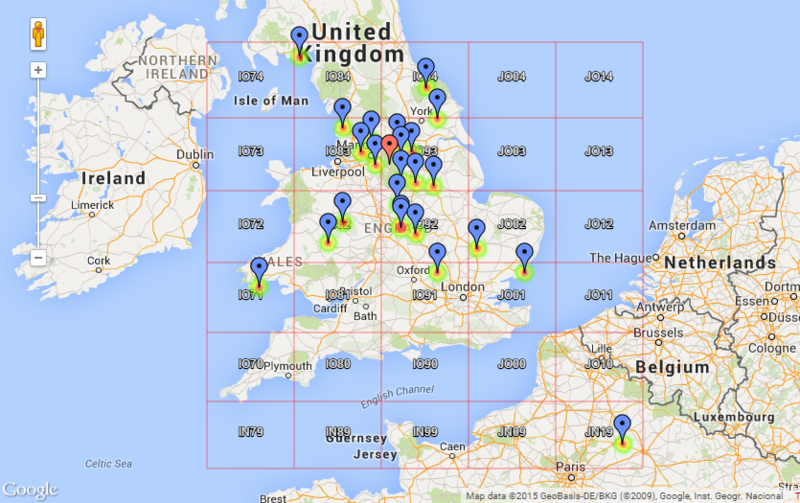 A map showing the QSO is available here. Altogether a most enjoyable afternoon operating in the afternoon sun. UPDATE – The results are now in. M0TAZ came third in our section.